Cutout mania back again: Whither Yahapalanaya? Soon after the Presidential election in January, orders went forth from the President’s office to remove posters put out by various politicians praising President Sirisena’s victory. 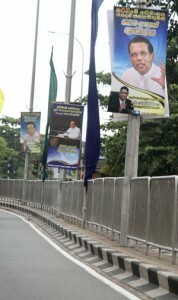 Together with President Sirisena’s photograph, the posters carried those responsible for placing them. Obviously that was to register what they had done. It included those of Nimal Lanza, Thilanga Sumathipala and Faiszer Musthapha. Probably, it was a sign of wear and tear in the Yahapalanaya machinery; or old habits die hard. For some of the high level delegations that attended the 70th sessions of the United Nations General Assembly (UNGA) last week, protocol and procedures did not matter. Sri Lanka was among at least three different nations which fell into this category. It was after President Maithripala Sirisena took his son as a member of the Sri Lanka delegation to the UNGA. The 24-four-year-old Daham Sirisena also took part in a youth summit representing Sri Lanka. Sirisena’s actions in taking his son to New York as a member of the official delegation was reported in the local media; then the social media took it over sending it viral with all sorts of saucy remarks and cartoons. Several websites criticised him bitterly for doing just the thing which he abhorred during the presidential campaign as “nepotism”. Every delegation is allowed six seats inside the UN General Assembly. In this instance, Daham had taken the place of the Sri Lanka’s Permanent Representative Rohan Perera. Even pictures had been posted in Daham’s Facebook account of him seated with his father. Later, some of the photographs had been “photoshopped” to exclude Daham. Embarrassed officials at the Presidential Secretariat made matters worse by placing another post, this time in President Sirisena’s Facebook account. It said that the son went as replacement to his mother and was invited. However, it did not say who invited him. Yet, serving as a member of the delegation, for which the Government of Sri Lanka has to pay for his air ticket, hotel and other costs is one thing. Sitting in the hallowed conference hall, as is clear, is only restricted to those who are declared as official members of the delegation. How did he qualify – with our UN Ambassador being kept out? To make matters still worse, Daham was also introduced to world leaders who met his father. They included Indian Prime Minister Narendra Modi and Swiss President Simonetta Sommaruga. The other who took his son to the UN was Belarus President Alexander Lukashenko. He did one better by taking his son to the lunch hosted by US President Barrack Obama and his wife Michele, to the visiting heads of state government. When it came to a photo opportunity, Mr. Lukashenko stood sandwiched between President and Michele Obama and and his son standing in between. Another incident which has taken the Australian media by storm is the conduct of Australian Foreign Minister, Julie Bishop. She took her partner David Panton to the UN assembly hall for the Sustainable Development Summit. He had wanted to listen to Pope Francis speaking, they say. When A.C.S. Hameed was Foreign Minister in the 1970s and early 1980s, he was often accompanied by his wife – but she was never a member of the delegation, nor did she usurp a delegate’s seat at the table. She always sat at the VIP section of the General Assembly. But a short-lived Foreign Minister who succeeded Hameed not only had his wife seated next to him but also dozed off on her shoulder when the Indian Foreign Minister was addressing the Assembly. The Indians took this as an insult.As in the case of Daham Sirisena, delegates are not aware that UN photographers are never seen in the Assembly hall but take photographs with telephoto lenses from overhead booths. The picture of the Sri Lankan Foreign Minister fast asleep was all over the Indian and Gulf newspapers courtesy Reuters. In Colombo, the Foreign Ministry tried to stop the picture from circulating, but the Sunday Times published it on page 1. When UN Secretary-General Ban Ki-moon hosted his traditional lunch for world leaders during the General Assembly session last week, President Sirisena found himself at the main table – and in the company of some of the world’s heavy hitters, including US President Barack Obama and Russian President Vladimir Putin. Whether President Sirisena was at the head table by design, by accident or by lottery was anybody’s guess. Traditionally, the front seat in the General Assembly is decided in an annual ritual by lottery. So were the favoured few who were picked to be in the same room as Pope Francis when he visited the United Nations last week. In an interview with the New York Times, President Sirisena was asked for evidence that he was winning over the international community, and before he could respond, the Times said, “his ambassador to the US Prasad Kariyawasam jumped in to say that the president had been offered a seat at the head table at lunch with Secretary-General Ban Ki-moon, along with Mr Obama and President Vladimir Putin of Russia.” The best way to a world leader’s heart is apparently through his stomach.